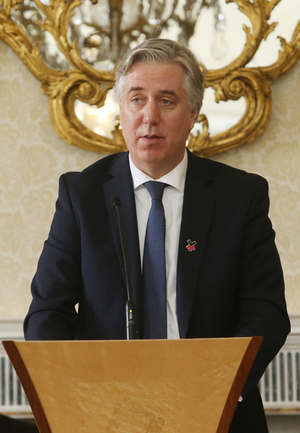 The CEO of the FAI John Delaney and other senior members of the FAI are to appear before the Oireachtas sport committee on April 10. Mr Delaney is expected to be asked about his €100,000 “bridging loan” to the FAI in 2017. Last night the State’s sports funding body Sport Ireland said it was seeking urgent clarification from Mr Delaney about the loan and the FAI announced it had responded in full to Sport Ireland. “Just this morning, members of the Oireachtas sport committee received a gentle reminder from the FAI for an event coming up on Thursday, the 4th of April, just six days before TDs and Senators are due to grill Mr [John] Delaney and co.
“Committee members are invited by the FAI to the UEFA U17 Championship 2019 draw in Dublin’s Aviva Stadium. “The invite tells TDs and the Senators how, before the draw, they can enjoy ‘a pre-drinks reception’, whilst afterwards the FAI invites members to the official draw dinner. “This, less than a week before the same TDs and Senators are due to question the same FAI about that controversial loan. In addition, Fine Gael TD Noel Rock told Mr Lenihan that invitations from the FAI, such as the one referenced above, are not “common practice”. Mr Rock also said the committee’s members were not invited to a similar draw in Dublin’s Convention Centre last December for the qualifying of Euro 2020. The members of the committee are Solidarity/People Before Profit TD Ruth Coppinger; Sinn Fein TD Imelda Munster; Social Democrats TD Catherine Murphy; Fine Gael TD Fergus O’Dowd; Fianna Fail TD Kevin O’Keeffe; Fine Gael TD Noel Rock; Fianna Fail TD Robert Troy; Fianna Fail Senator Mark Daly; Fine Gael Senator Frank Feighan; Fine Gael Senator John O’Mahony and Independent Senator Pádraig Ó Céidigh. Posted in Misc and tagged FAI, Football Association of Ireland, John Delaney, Oireachtas Committee at 2:56 pm on March 21, 2019 by Bodger. Wonder if his divorce went through yet. Still waiting for someone to explain why exactly the loan was controversial. Unusual for sure, but is there anything ilegal or dodgy about it? I believe it’s because of the fact that FAI are grant-aided by Sports Ireland, and if there were difficulties in getting access to money, they (SI) should have been informed. I will stand corrected on that if someone knows of a better reason. I don’t know if it was illegal or dodgy, and I’m sure they’ll have a fine explanation for it by April 10th, but I do know that Sport Ireland are questioning why they were not informed about the FAI’s cash flow crisis when informing Sport Ireland of such things is part of the terms and conditions of receiving grants from Sport Ireland. The thing is, a journalist on second captains yesterday was saying that cash flow is a constant problem in the fai, more or less alluding to seat of the pants governance. If it really was a loan to make payroll or keep the lights on , then there really isn’t any need for the hoohaa. However if there’s more to it, then I’m all for the further questioning. you mentioned cashflow. well cash doesn’t always flow the way you might normally expect it to in the professional soccer environment. I’ve seen it personally. It’s not unusual for people who are up to serious stuff being caught out first on a smaller matter. I beg the question why the redalert court attempt. They got a €2m overdraft (as at end 2017). To need to borrow €100k from their CEO is genuinely a bit odd. I hope Catherine Murphy tears him a new one. She can tear all she wants, FIFA has a track record when politicians ‘interfere’ with local FAs. 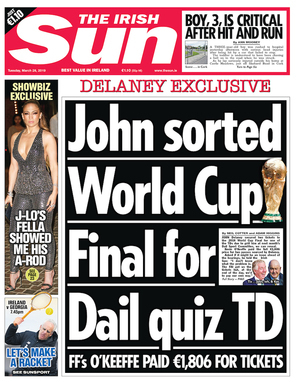 Only in Ireland could a man like Delaney go so far. Well, maybe in Nigeria, Zimbabwe, Venezuela, Belarus, Malawi, Kazakhstan, Ukraine or Albania. Or Norn Iron. I thought this was going to be an announcement of his resignation. Oh well. Remember the last time the FAI was in hot water over a €5m FIFA loan was that written off in questionable circumstances? 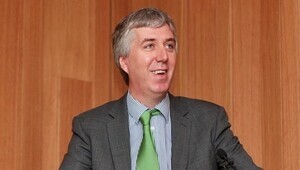 Remember THAT time when John Delaney was summoned to the Oireachtas sports committee? Guess what happened. Go on, guess! “Earlier this month attempts to bring Delaney before the Oireachtas committee on tourism and sport, to answer questions about the payment, failed after most of its members lost their initial enthusiasm. Some later said publicly that they had been contacted by Delaney. oh no .. AN OIREACHTAS COMMITTEE! .. he must be terrified. unless he realises, he literally has to show up, and anything after that doesnt matter, coz he’ll walk away from it no matter what. the gov. arent the type to you know, hold millionaires accountable. What sort of mismanagement took place in a long established and fairly stable business that they needed a loan to keep the lights on or pay staff salaries? Is it not a giant conflict of interest for the head of said organisation, who is supposed to be the CEO and therefore responsible for the mismanagement, to then pay money out of his own account to cover up the mismanagement? What is the current state of affairs of the FAI’s books and if they are operating in lean times why maintain a salary of E360k to the CEO, twice the amount his counterpart in Italy or France is paid and with a tenth of the population? If the FAI is on the bread line does it have anything to do with paying MON and RK an alleged E2m and E600k respectively (should this wage not be performance based)? What does Delaney actually bring to the table in the FAI for this large sum of money, no doubt there is a large team of people already working promotion, sales, marketing etc, what does this genius contribute? Should his salary and that of the management board also be performance related? If he is sacked, which is highly unlikely now as he no doubt got some sort of deal or favour for the E100k from his pocket, what is his severance package details? Also interesting, nice one Vanessa. What have you got against Kenyan betting platforms? Coincidence! Delaney to be replaced as CEO. But he’s not out. Do we really want someone who fought to conceal a significant financial transaction being in the thick of such behind-closed-doors negotiations and contract awards? It’s a disgusting move by the FAI, one the likes of FF or FG would be proud of. The brass neck of the man. To actually be seen out in public, at matches and events, after a stunt like that and no bother to him. I assume he has no requirement to turn up at the Oireachtas hearing now?.Someone else will have to do the lying and the cover up for him. Will he be at the U17 UEFA draw for drinks and dinner that they invited the Oireachtas committee to last week? And what is his new remuneration package as “Executive Vice President”, same salary as CEO or did they sweeten the deal to commence next year when this dies down a bit. Also when is the President stepping down to make way for Delaney, that’s part of the deal somewhere right? Miscreant son like miscreant father. His father Joe Delaney had been forced to resign as treasurer of the FAI when it was revealed that he had paid £100,000 out of his own pocket to a ticket tout known as George The Greek. He had made the payment to wipe out a shortfall in the FAI’s World Cup ticket account – the result of a serious miscalculation. John, then just 27, was in the Westbury Hotel that evening to stand by his father’s side. He never forgot the bloodletting. He vowed to make up for the blow his father had been dealt and bring the Delaney name back to the top of Irish soccer. €120,000 pa apparently. Because he’s worth it. I gonna put that down to the FAI spin machine for now, let’s see what happens in the future. He was having his E3000 a month rent paid for by the FAI too. What was his total package on top of E360k wage, car, rent and all the other perks he was leveraging, corporate box’s etc, invites to FAI functions etc, the brown envelopes and favours from that must be worth another 100k. What is his pension package and is that the stumbling block to getting rid of him, they just can’t afford to sack him, instead kick it down the road for the next batch of yes men and women. If he/they don’t answer, directly, at the Oireachtas meeting then cut state funding and see what they do. It would appear that the accounts of the FAI are not the healthiest after being cooked for a decade or longer, let the FAI go bankrupt or get rid of your toxic puppeteer, your choice FAI.